I'm usually a fan of cemeteries. I think they can be beautiful places to visit, and many of them around the world are really unique. But there's one kind of cemetery that is harder for me to visit: the military cemetery. And it’s not because I don’t appreciate the fact that the thousands of men and women buried in them sacrificed their safety — and, in many cases, their lives — for their country. In fact, the reason is almost exactly the opposite. I get really emotional at military cemeteries. At memorials. Even sometimes at parades to celebrate holidays like Memorial Day. Hearing “Taps” played slow and sure on a trumpet almost always brings me close to tears. I stood at a burial and watched a veterans group fold the American flag — methodically, and almost fiercely — next to my grandfather’s casket as the poem “Freedom is Not Free” was read aloud. I bawled my eyes out, both because I was already missing my Papa, and also because I could not fathom having to witness the same ceremony for a sibling or parent or spouse killed in action overseas. It breaks my heart to think about. But, the reality is, these things happen. Men and woman go off to war and return home in flag-draped caskets — if they return home at all. Some are buried in beautiful national cemeteries with pristine grave markers and close-cropped grass, while others rest in unknown graves. 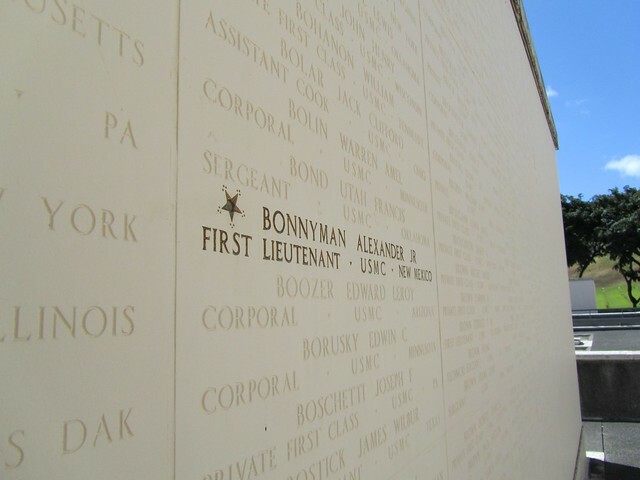 Some even get their names etched on walls that honor our nation’s fallen. And, even though they often turn me into a blubbering mess, places like the national cemeteries and memorials are important to visit. When I was in Hawaii last month, visiting Pearl Harbor was at the top of my list. I knew it was a site not only of national military importance, but also of importance to every American. It was the spot where we were attacked on our own soil. After spending an afternoon at Pearl Harbor, someone suggested I should also check out “The Punchbowl,” which is the colloquial name for the National Memorial Cemetery of the Pacific. I hadn’t even heard of this place before; it hadn’t come up in any of the guidebooks or online Hawaii guides I’d read about the state’s “must-visit” attractions. But I decided to visit it anyway. And I’m so glad I did. 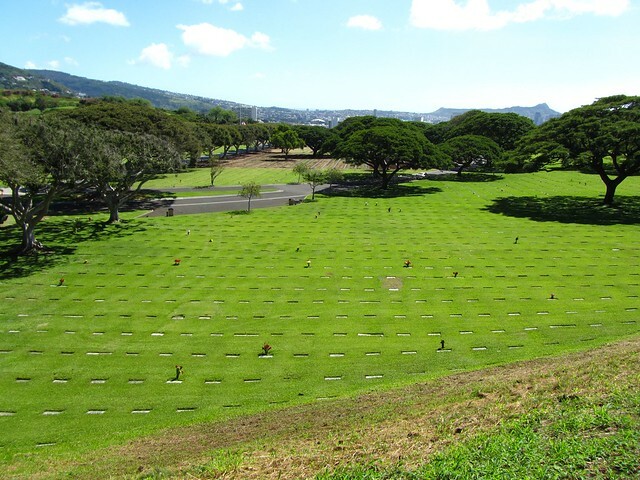 The National Memorial Cemetery of the Pacific lies in a volcanic crater sitting high above the city of Honolulu. The crater, formed thousands of years ago, resembles a shallow punch bowl – hence its nickname. Congress appropriated money to begin constructing the cemetery in 1948, years after it was first proposed. 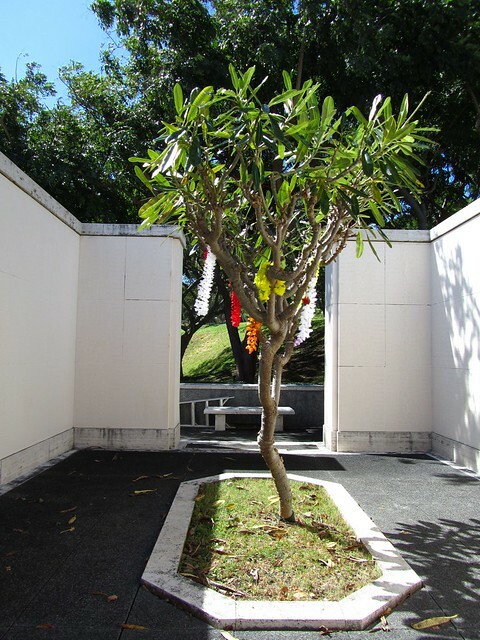 The project had been in limbo for about 5 years due to finances, but, after World War II, the remains of thousands of soldiers were awaiting permanent burial in Guam, and so the government finally decided to fund the national cemetery in Hawaii. The first burial took place in the cemetery on January 4, 1949, and the cemetery was opened to the public on July 19 of the same year. 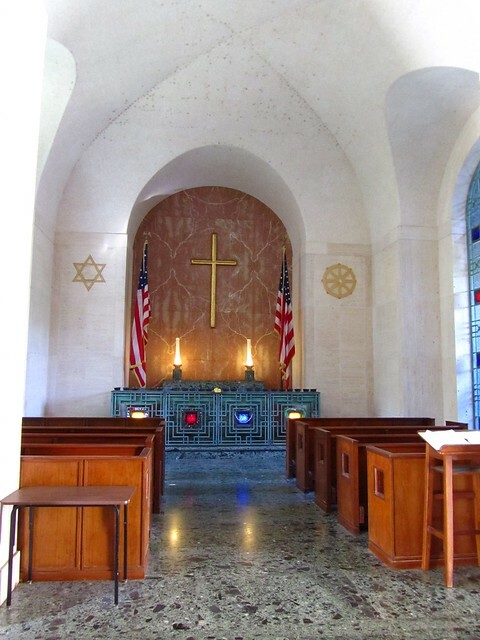 Eventually, more than 13,000 soldiers and sailors who died during WWII would be laid to rest in the Punchbowl. In total, 34,000 veterans of WWI, WWII and the Korean and Vietnam wars have been interred in the cemetery, filling all the gravesites. 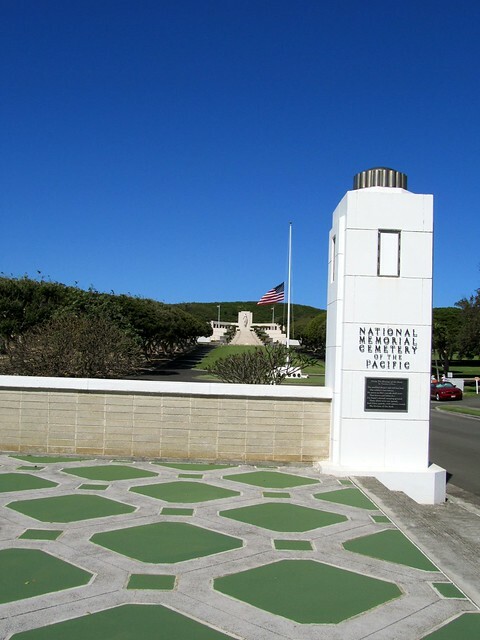 In 1976, the National Memorial Cemetery of the Pacific was placed on the National Register of Historic Places, and today sees roughly 5 million visitors per year. When I arrived to the cemetery grounds on foot, I was immediately struck by how incredibly huge this cemetery is. 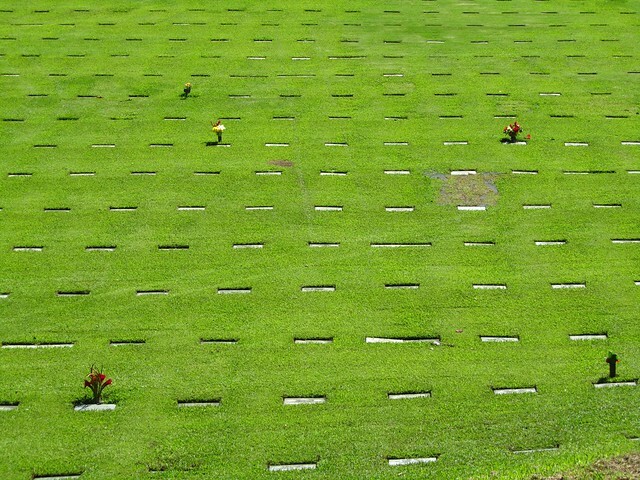 Graves with flat markers stretch in every direction — dark spots on the otherwise perfectly-groomed grass. When you enter the Punchbowl, one thing immediately catches your eye beyond its sheer size — and that’s the white marble memorial itself. Located at the end of a long drive lined with towering white-barked trees, the memorial is striking. 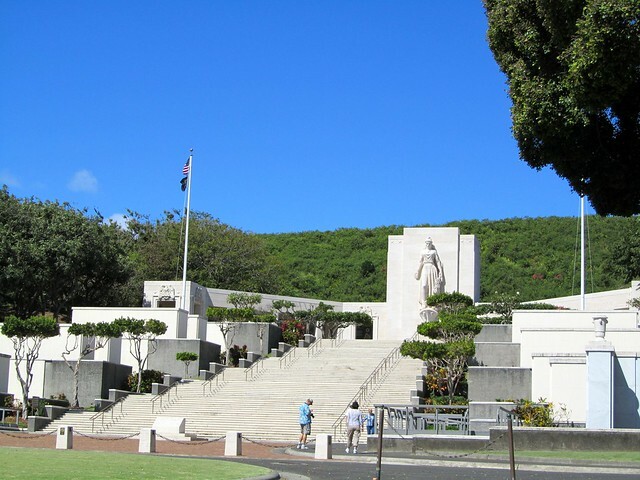 Built in 1964, this impressive structure contains a small chapel, tributes to various battles fought in the Pacific, as well as walls with names etched on them of those who were never recovered from battle. Lining the memorial’s grand staircase are marble slabs making up the “Courts of the Missing.” Here, the names of 28,788 military personnel who are missing or who were lost or buried at sea in the Pacific during WWII, the Korean War, or the Vietnam War are etched into the stone in neat rows. I ran my fingers over the names of young soldiers from Ohio, New York, Washington and everywhere in between. Soldiers who never made it home. At the top of the wide, white staircase hovers Lady Columbia in the Court of Honor. She is there to represent all grieving mothers, and is almost like a silent guard over the memorial. 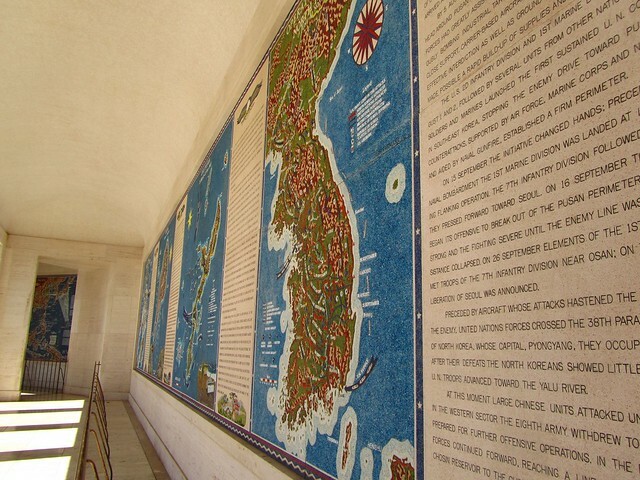 After reading some of the names listed in the Courts of the Missing and having at least a few tears leak out the corners of my eyes, I made my way into the back of the memorial, where a covered hallway is lined with mosaic maps depicting different battles that took place in the Pacific. There’s also a little nondenominational chapel that’s open for anyone to use. Here, it’s cool and quiet. Even I was tempted to stay and sit quietly for a while, but I was afraid that sitting and reflecting on death might just make me cry more. So, instead, I headed back out into the afternoon sunshine and pointed my feet in the direction of the Memorial Walkway, which is lined with plaques honoring America’s veterans. And while it’s nice to read all the inscribed messages, the real reason people take to this walkway is for the view at the end. 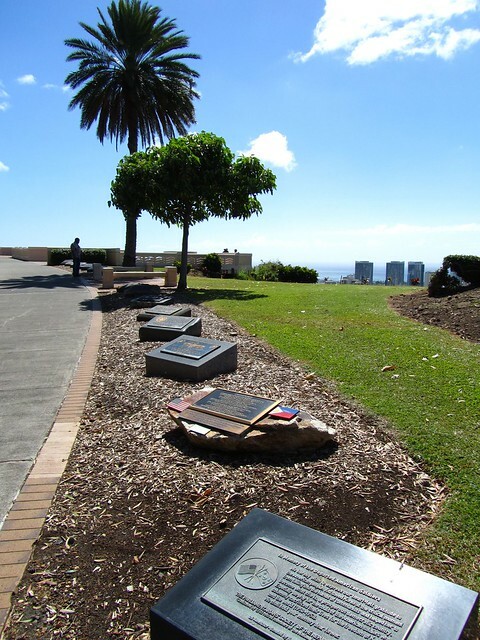 Perched on the rim of the Punchbowl crater, the overlooks at the end of the Memorial Walkway offer arguably the best views out over Honolulu. 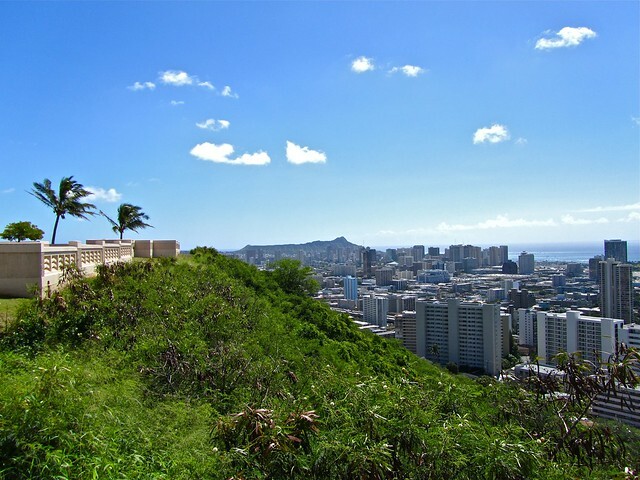 On a clear day, you can see all the way to Waikiki, and even beyond it to Diamond Head. I took my time going through the cemetery. I walked slowly and quietly between the graves. I tried to be respectful when I took my camera out. I sat for a while on a bench and hoped I wasn’t being too rude as I watched a nearby family picnicking next to the grave of a loved one. It was a perfect, sunny Hawaiian afternoon. Most people like me — that is to say, tourists — were probably lying on towels in the sand somewhere, perhaps sipping on chilled fruity drinks. But I wouldn’t have traded my visit to the National Memorial Cemetery of the Pacific for any amount of beach time. 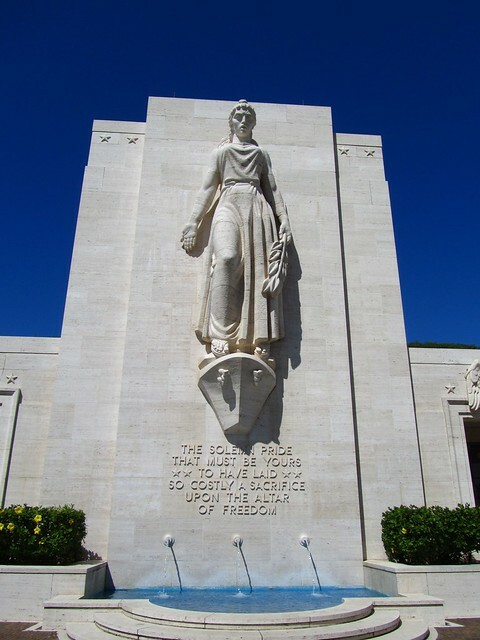 If ever you find yourself in Honolulu, I hope you'll take the time to visit the National Memorial Cemetery of the Pacific, too. 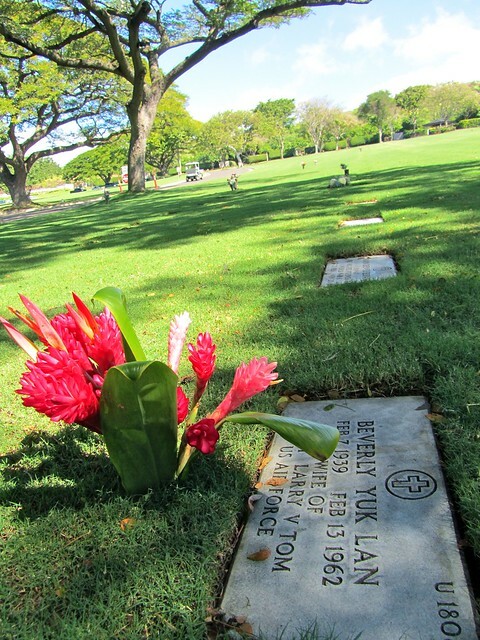 WHERE: The National Memorial Cemetery of the Pacific is located at 2177 Puowaina Dr in Honolulu. WHEN: The cemetery is open daily from 8:00 a.m. to 6:00 p.m., and there is no fee to visit. TRAVEL TIP: Pair up your visit with a tour of Pearl Harbor, like this . 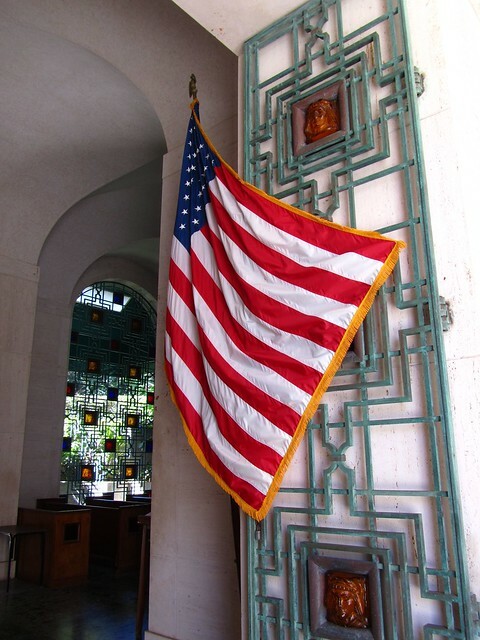 Do you visit national and/or war memorials when you travel? Do you agree that it's important to visit such places, even if they make us sad? I would love to go to a war cemetery, just to see how it differs from regular ones athough I don’t think I’ve ever been in a country that had one. The only difference I can think of is that everything at a war cemetery is very… regimented, if that’s the right word. The grave stones are all the same, even though some are dotted with flowers here and there. The grounds are groomed perfectly. The flags are all in pristine condition. In fact, the National Memorial Cemetery of the Pacific was just beautiful. That’s not usually a word I would use to describe a cemetery, but this particular one really was. Ah..I feel as though I find war memorials everywhere, although perhaps because I’m based in Europe. Like you, I always find them incredibly moving. A beautifully written piece. Yes, I imagine there would be A LOT of war memorials in Europe. But you have to remember that we actually haven’t have very many wars fought on U.S. soil before… And most of our big memorials are located in Washington, D.C.
Beautiful post. 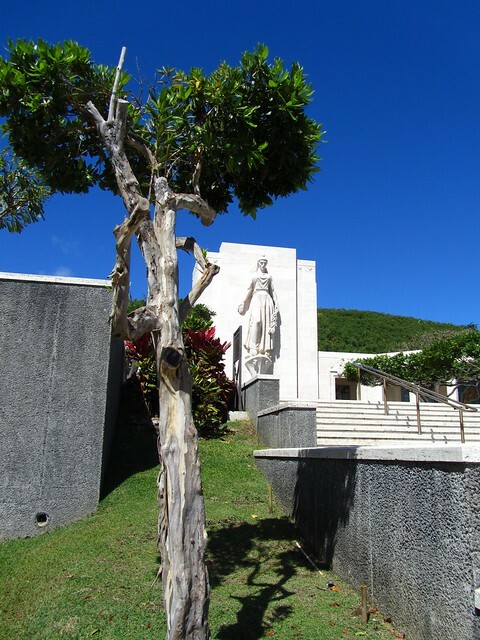 Your pictures and words have captured The National Memorial Cemetary of the Pacific wonderfully. I have never been to a war cemetery, but I can imagine the emotion that is felt when experiencing it. My grandfather was in the British Navy in WW2 and made it out alive, so I have heard many stories from him about those who were lost. I too get pretty emotional when thinking about it or hearing these stories. Thanks so much for the kind words, Pete. This is the first war cemetery I had ever really explored, so it was definitely emotional. And the fact that I was on my own I think allowed me to really just take my time with both the sights and the feelings. I actually love cemeteries of all varieties. Odd, I know. Normandy is high on my list of places to go visit for that reason. Cemeteries are really interesting to visit. I would totally go to Normandy if I had the chance, even though I know I’d probably spend the whole time bawling my eyes out. I’m with Michael. I absolutely love cemeteries and wrote my graduate thesis on 18th century benevolent societies (which paid for burials back then). The New Orleans second line celebrations came out of funerary traditions too. But I digress…. I liked this piece. Even if you are a pacifist, visiting a war cemetery can be a moving experience. No matter whether you believe a war was just or not, it’s important for countries to take care of those that sacrificed….and for others to respect the sacrifice. And don’t get me started on those jerks who are holding anti-gay protests outside military funerals. Thanks for reading, Chris! And I agree, no matter your thoughts on war, it’s important to recognize those who sacrificed their lives for our country. I don’t support some of the wars the U.S. has gotten into in the past (and some in the present), but I would never not appreciate our soldiers and sailors for what they do. And I agree about the protesters showing up and military funerals. I’d like to declare a war on THEM, and then deny them a memorial. Love the pictures Akatuki. They caught my attention straight away. Thank you, Natalie! The photos I took here are actually some of my favorites from Hawaii. The colors were perfect, and the subject matter definitely moving. Glad you enjoyed the post! Not really into cemetery tourism but this site seems very nice. Beautiful location for it too. The location couldn’t be any more beautiful. In fact, I feel like the view from the crater might be the best view in Honolulu! Beautiful post. Thanks for this. I just visited there today, looking for the name of my father’s cousin who went down with his plane at Truk. Beautiful cemetery and monument, more then a few tears. Your pictures match the beautiful day here today. I admire you for walking it, but we drove!! 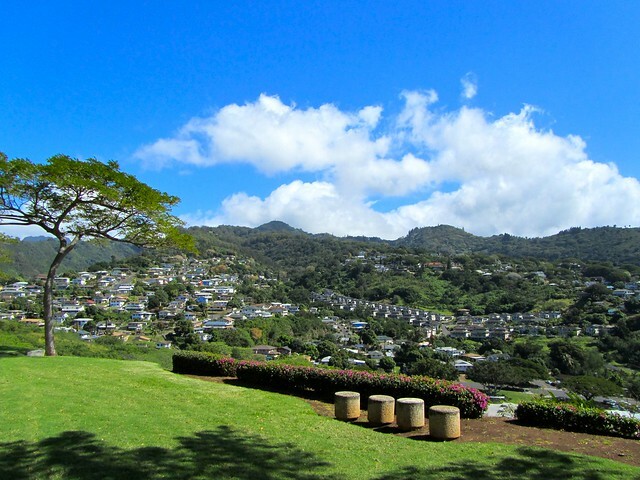 I’ll be back to visit Punchbowl again as my daughter is currently stationed in Hawaii. It really is such a beautiful memorial and cemetery. I’m really glad I went (even though, yes, I would highly recommend walking instead of driving! haha). I am President of the USS Drexler DD741 survivors yearly reunions. I would like to know how some of our relatives of the ships sinking KIA’s could write to you for information as to how they could get a photograph of the name of their loved one that is in the Courts of the Missing. Our organization would appreciate your help with helping us for results. I thank you for any help you can give us. Sincerely, Eugene Brick, a survivor. Hi there Eugene. First of all, thank you for your service. 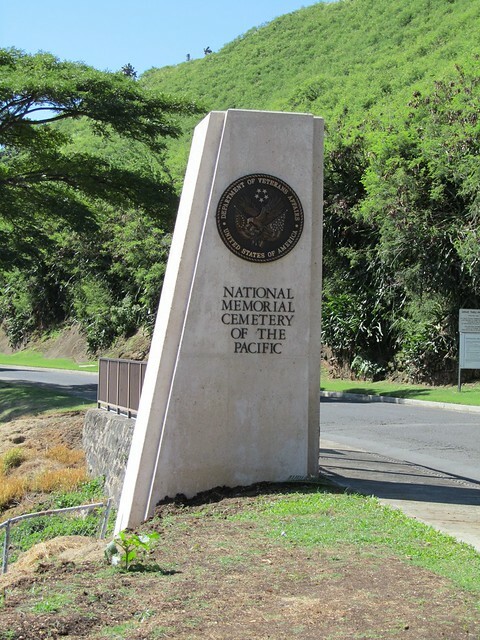 I’m afraid I don’t have any sort of relationship with the National Memorial Cemetery of the Pacific. This post was written after my visit there a few years ago (as a tourist), and I’m afraid I don’t live close by to help out with any photos unless they are already included in this post. But this page mentions that the cemetery can help out with photo requests from family members: (there’s also a phone number listed there). I’m sorry I can’t be of more help! Awesome, as I just discovered that my paternal uncle is buried there. Will definitely share with other family members. It’s a very beautiful cemetery – definitely worth a visit if you’re ever in the area. I am about to take a high school military group to Oahu. The Punchbowl is on our list to see. How much time should I expect to spend at the Punchbowl? It’s a big cemetery with the memorial part in the center. I’d say at least an hour? Beautiful photos and well written. May we never forget the men who died for freedom.